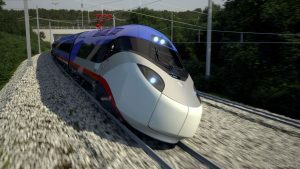 Alstom’s Avelia Liberty high-speed train for Amtrak will make its debut in 2021 with rail service linking Boston, New York City, and Washington, D.C. This inter-city service will stretch across approximately 457 miles at speeds up to 186 mph. Alstom designed and built these high-speed trains based on proven technology with more than 1,000 high-speed trains in service worldwide. Avelia Liberty provides more space and improved comfort for passengers, with enhanced safety and reduced energy consumption. Consilium Marine & Safety specializes in the fire protection for the rolling stock industry and is delivering the fire detection, line heat detectors and the Stat-X fire suppression. Consilium Marine & Safety was instrumental in the integration of Stat-X® fire suppression systems which are protecting the power distribution area of the power car on all 28 new trainsets. This is a thirty-year project. Installations are currently in process. These features make Stat-X fire suppression the optimal solution for enclosed special hazard applications. Stat-X currently protects many rolling stock fleets worldwide including the high-speed Eurostar railway which connects London, Paris, and Brussels in Europe. Stat-X condensed aerosol fire suppression is a solution for many transportation applications including rolling stock, buses, mass transit, and heavy equipment. Apply to become an authorized Stat-X distributor. © 2019 Fireaway Inc. All rights reserved.